Seven to 10 days before Norooz, put 2 cups of unpelted wheat (enough for a 1 large plate) in a bowl and cover with tap water. Leave for 2 days. Change the water once after 24 hours. Pour the wheat in a plate 1″ deep. The plate should have a small rim. Cover it with wet thin cloth and put it in front of a window that gets indirect sun. The cloth should be wet at all times but not soaking. Once you see the green tips (about 1/2 inch sprouts), remove cloth and to maintain, spray the wheat 2x a day generously with water. Make sure you drain excess water or it will develop mold. Cover two cups of unpelted wheat with an inch of water in a bowl. Soak for 24 hours, 7 to 10 days before Norooz. Rinse and drain the wheat germs, then add enough lukewarm water so the seeds are covered in about one inch of water, soak for about 12 hours. Drain and rinse the seeds. Spread the seeds on to a final plate in one inch layer. Cover the seeds in a moist paper towel or thin cloth and put it in front of a window with indirect sun. Daily sprinkle the towel with water and make sure towel is always moist. Once you see the sprout is about 1/2 inch long remove the towel. Continue to keep sprouts moist with fresh water. Always drain the excess water. Good luck. If one method doesn’t work, don’t be discouraged … try again. Leaping over open fires, feasting on foods rich with symbolism, and general merrymaking — these are all aspects of Nowruz, the springtime holiday that heralds the start of the Persian new year. Straddling the spring equinox (around March 20), this pre-Islamic festival, whose name means “new day,” has roots in the ancient, fire-revering Zoroastrian religion and is believed to be 3,000 years old. Today, Nowruz is observed in Iran and in parts of Turkey, Iraq, the Caucasus and Central Asia. Harking back to the holiday’s Zoroastrian origins, the purification ritual of jumping over bonfires is one of the most popular Nowruz traditions. The Freer and Sackler, not wanting to risk igniting priceless art, offer child-friendly faux fires outside both galleries made of orange cloth “flames” blown by fans. 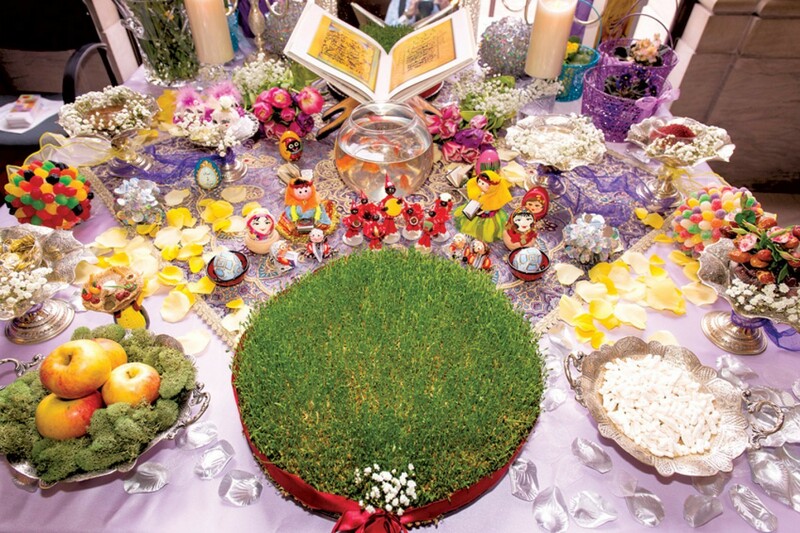 The centerpiece of any Nowruz celebration is the haft sin (meaning “seven s’s”), a table laid out with seven foods that each start with the letter “s” in Persian and have a symbolic meaning — including sprouts (rebirth), apples (health and beauty) and garlic (medicine) — along with items like coins and candles. The Sackler Pavilion and the Freer North Corridor each showcase a haft sin table. At the Freer, you can make your own haft sin paper collage. Freer Gallery of Art, Jefferson Drive and 12th Street SW; Arthur M. Sackler Gallery, 1050 Independence Ave. SW; S. Dillon Ripley Center, 1100 Jefferson Drive SW; Sat., 11 a.m.-5 p.m., free.